Today's featured author from FIRST is Lena Nelson Dooley and her book, Mary's Blessing. Mary Lenora Murray was adopted by parents who had recently lost a child while on the last wagon train west in 1867. When she is thirteen years old, Mary’s mother and her two older sisters die in the cholera pandemic, leaving her the oldest child with four younger siblings to raise. Her father, in his grief, pours himself into keeping the farm going, leaving the running of the home entirely in Mary’s hands. 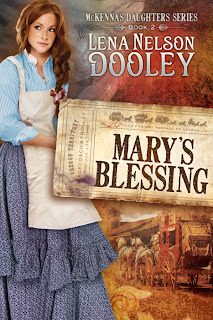 Mary's Blessing is the second book in Lena's McKenna's Daughters series. In the first book, Maggie's Journey, we learn of a mother who dies giving birth to triplet baby girls. Their father, unable to care for them in his grief, chooses two families to adopt two of the babies. Book one and book two of the series are about the two adopted girls. Mary's story is pretty sad. Not only is she taking care of her father and siblings despite her own grief, a tragic accident, followed by a misunderstanding with her suitor, Daniel, quickly plunges Mary back into despair. Although the end has the spark of 'happily ever after,' the journey to get to that point was a pretty serious, somber tale. The story was still enjoyable to read, despite some grammatical errors that bugged me -- including a huge whoops on the back cover! Mary Lenora Caine knows she is adopted... nope. Caine was the last name of the book one triplet, Margaret! When I first saw that, I thought there was a mystery in the book where Mary's name was really Caine or she marries a Caine. No, just a missed mistake. However, the errors weren't big enough to turn me off to the story. I couldn't help but empathize with poor Mary. I loved that the townspeople/church family were so willing to help Mary, and her humbleness to accept the help endeared me to her character. Of the two books so far, I enjoyed Maggie's story more...but I can't wait for the final book to the series! The girls' father (I think!) was mentioned in Mary's Blessing and I can't wait to see how/what/when/if the girls are finally reunited! "Pa?” Mary Lenora Murray shouted back over her shoulder as she picked up the heavy picnic basket. “You ready to go?” Why does he always drag his feet when we’re going to church? When did my life become such drudgery? Had it ever been anything else? At least not since Ma died, which seemed like an eternity ago. Visions of coming home to her each night and building a family together moved through his head like the slides of photo- graphs in the Holmes stereopticon they had at home. He loved her already, but more than that, he wanted to get her out of that house, where she was loaded down with so much work and responsibility. Daniel had often gone with his mother when she bought fresh produce from the Murrays, so he knew what her life had been like since her mother died. Their families came to Oregon on the same wagon train, so he’d known her all his life. He was only three years older than she was, and he had watched her over the last few years as she blossomed into a beautiful young woman. Their familiar ritual warmed his heart. He looked forward to creating family rituals with Mary. Once more he whistled as he headed toward the brougham. Nothing could cloud his day. When they pulled up to the Methodist church, his father guided the team toward the back, where a large area paved with fine gravel gave plenty of space for those who arrived in horse- drawn vehicles. While Father helped Mother down from the open carriage, Daniel took the reins and tied them to one of the hitching rails that outlined the space. He chose the rail under a spreading black cottonwood tree where the limbs were just beginning to show the leaf buds. George and Bobby, Mary’s brothers, scrambled across the seat, followed by Frances. The wagon wheels settled into the gravel, and Mary pulled on the reins. “Easy. Settle down.” Even though she spoke to the horses, he heard every word. His heart that had almost leapt from his chest also settled down when he realized she was no longer in danger. Thank You, Lord. The younger children climbed out of the wagon and followed their sister’s instructions. Mary watched them until they’d gone around the side of the building toward the front. Then she stood up. Before she could try to climb over the side, Daniel hurried to help. He held out his hand to her. She stared at it, then looked at his face. “I’ll help you down.” He gave her his most beguiling smile. For the first time since she arrived, she smiled back, and pink bled up her neck into her cheeks. Her blush went straight to his heart. Oh, yes, he loved this woman. Mary slipped her slim fingers into his hand. Even through the white cotton gloves, he felt the connection as warmth sparked up his arm like fireworks on Independence Day. She glanced down so she could see the step. When she hesitated, he let go of her hand and both of his spanned her tiny waist. With a deft swing, he had her on the ground in seconds. He wished he had the right to pull her into an embrace. Wouldn’t that just set the tongues a-wagging? He couldn’t do that to her. Mary needed to be cherished for the treasure she was. And as far as Daniel could see, her father really didn’t treat her that way. He watched her walk toward the front of the building, enjoying the way her skirt swayed with each step, barely brushing the tops of her black patent shoes. That is one beau- tiful woman. He turned back to her team. Walking beside the horses, he led them toward the hitching rail where his family’s brougham was parked, hoping it would give him the oppor- tunity to help her back up onto the wagon seat. As he crossed the lot, several other conveyances entered, and he waved and exchanged greetings with each family. His woolgathering slowed the progress of tying the horses to their spot. He needed to hurry so he wouldn’t miss the begin- ning of the service. As he opened the front door, Mrs. Slidell struck the first chord on the new Mason and Hamlin reed organ. The church had ordered the instrument from the manufacturing plant in Buffalo, New York. When it arrived only a couple of weeks before, the music added a special feeling to the worship and helped most people stay on the right tune better than the old piano did. He hummed along with the introduction to “What a Friend We Have in Jesus,” his favorite hymn. Throughout the service, Daniel had a hard time keeping his mind on the proceedings. Mary sat close enough for him to touch her if he leaned a little to his right. He was so tempted to bump against her arm, but he held back. He imagined clasping her hand in his and holding it for longer than just a few seconds while helping her down from a conveyance or through a doorway, really wrapping his large fingers around hers and intertwining their fingers. Just thinking about it caught his breath. He whooshed it out, and she turned toward him, her eyes wid- ening with a question. After flashing a smile at her, he glanced up at Rev. Horton. The man’s delivery was smooth, and his words made a lot of sense. He’d be a good pastor for them, but Daniel couldn’t keep a single word of his message in his mind. Not while he could feel Mary’s presence with every cell in his body. Instead, in his mind he searched up and down the streets of Oregon City, seeking a place to turn into a home for him and his beloved. If the right house wasn’t for sale, he could build her one. She could help him choose the design. That’s what he’d do. Build her the home she’d always dreamed of. His heart squeezed with the knowledge of what he planned to do. He could hardly keep the idea to himself. He hoped it wouldn’t take too long for him to convince her that they should marry. He’d even hire servants to help her manage their home. Whatever her heart desired, he’d do everything he could to present her with all she wanted. He only hoped it wouldn’t take too long. At twenty years old, he was ready to move on to the next phase of his life—with Mary by his side. “Now let us bow our heads in prayer.” Rev. Horton raised his hands to bless the whole congregation. Daniel dropped his head toward his chest. How had the man finished his sermon without Daniel noticing? Next Sunday he’d have to listen more closely. He really did want to get to know the new pastor and his family. Four stair-step youngsters stood beside their mother. The tallest, a boy. The next, a girl. Then another boy, and the shortest, a cute little girl. As if they had rehearsed it, they bowed toward the people in unison. “I hope you all brought your blankets and picnic baskets.” Father beamed at the crowd. “We’re going to spread our food together. I believe there are plenty of sawhorse tables set up near the building. And you can pick a spot under the trees to settle for your meal. Just don’t forget to take the time to greet our new ministerial family while you’re here.” Father led the Horton family down the aisle and out the front door. “Oh, yes. I’m a man of many talents.” His heart leapt at the interest he read in her gaze. Things were well on their way to working out just the way he wanted them to. Thank you to Lena and FIRST! And a special thank you to Althea, from Charisma House, for squeezing me onto this tour at the last minute and sending me a copy to read and review! 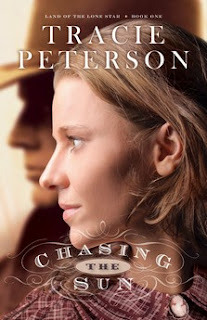 I had the opportunity to review Tracie Peterson's newest book, Chasing the Sun, courtesy of Bethany House Book Reviewers. Hannah is desperate for help in protecting her siblings and Texas ranch. William is determined to regain his family’s land—the land Hannah says she owns. Bound by need but divided by their dreams, Hannah and William form an uneasy truce. In the face of unforeseen challenges, can the blush of first love survive? In the last few years, Tracie’s books have been hit or miss with me, but I really enjoyed Chasing the Sun, book one of her newest Land of the Lone Star series. Hannah was a strong, yet vulnerable character who was easy to like and understand. I also loved the Texas ranch setting colored by the Civil War. I don’t think I fully realized that property was seized from Northern sympathizers during the war and given to more ‘worthy’ owners. That idea made for an even better story when the original owner, William, arrives back home to see his family ranch is occupied. Occupied (of course!) by the lovely Hannah. Hannah agrees to let Will stay as a ranch hand until the legality of true ownership is settled. Meanwhile, as somewhat predictable feelings begin to develop between Will and Hannah, she is being pressured into a loveless marriage by her father’s greasy partner, Mr. Lockhart. The story has a sinister vein as Mr. Lockhart is even more greasy than anyone realizes. Chasing the Sun had all the right elements in all the right places for a sweet, engaging, Western-style story. I liked it and am looking forward to the second Lone Star book! Thank you to Tracie and Bethany House for sending me a copy to read and review! I've got a great, quick giveaway for you, courtesy of PrintRunner! 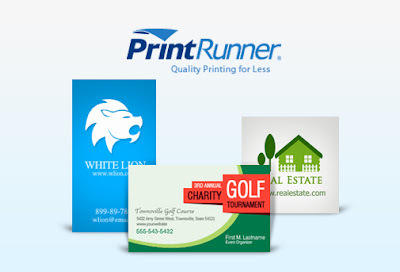 PrintRunner is an online printing company that offers print business cards, brochures, magnets, and much more! PrintRunner is going to give one of my readers 250 Business Cards! These little cards aren't just for big 'business' anymore! These small cards are perfect for work-at-home moms, gaining readers for your blog, mommy calling cards, lending cards for your home library, or just about anything you can think up! Enter using the rafflecopter form below! Hurry, giveaway ends Monday, May 28! 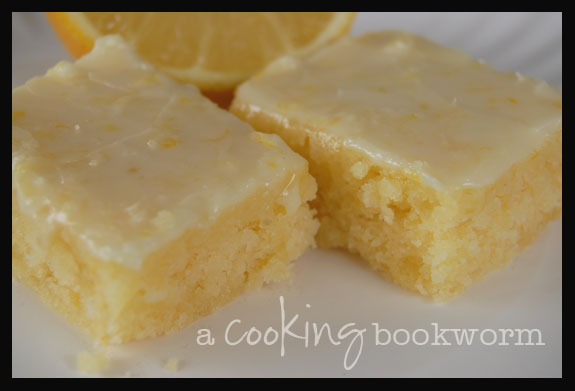 Thank you to PrintRunner for providing A Cooking Bookworm with this giveaway as well as a set of free business cards for hosting. Today, CFBA is introducing Chameleon by Jillian Kent. How much can you really know about someone? Lady Victoria Grayson has always considered herself a keen observer of human behavior. After battling a chronic childhood illness that kept her homebound for years, she journeys to London determined to have the adventure of a lifetime. I enjoyed Jillian's previous book, Secrets of the Heart, a mysterious regency romance, which is why I chose to review Chameleon. I'm awaiting the book to arrive in my mailbox! When I can, I'll update this section with a link to my review! Chameleon has a really strange character: Talon. Very strange and a bit creepy. Ok, a lot creepy. Talon trains birds to attack people. Did I mention creepy? The whole story revolves around the dark mystery of Talon. Who is he? Why is he using his birds to hunt and maim or kill members of Parliament? The whodunit ending was very surprising - I hadn’t guessed it. When I noticed that a main character in the book, Ramsay, was misspelled on his first and second appearances in the book as Ramsey, I was afraid there might be trouble. Sad to say, the editorial errors were numerous and more glaring than just spelling. These mistakes made reading difficult and confusing. I really like the Regency style of Jillian’s writings. Her subject matter of mental health practices of the day makes her books unique and different (although Talon was almost too much for me in this book). Unfortunately, the editorial errors made the book hard for me to enjoy, and Chameleon ultimately couldn’t win me over. with new experience and character. AMES PARK loomed in front of them, shrouded in a mist that created difficulty for horse and driver as the coach and four maneuvered its way into the park. Inside the vehicle Victoria leaned toward the window, straining to see the outline of trees. "Such a disappointment," she sighed. "This is not what I expected my very first morning in London. I'd so hoped to see more on the ride through the park, something exciting to tell Devlin when we get to his home." "Don't despair, my lady." Nora, her maid, pulled a heavy shawl tighter about her shoulders. "'Tis sure to be the same mist that abounds in Yorkshire. This nuisance will lift eventually. It always does." Victoria patted the sleek head of her dog. "Even Lazarus grows bored." She marveled at her best friend, a behemoth of a mastiff, as he lowered his bulk to the floor of the coach with a loud groan and laid his head across her slipper-covered feet, creating a comfortable warmth. He'd been with her for years, and she couldn't leave him behind. The poor dear would cry himself to sleep every night. Victoria allowed the clip-clop of the horses’ hooves and Nora’s penchant for humming songs to lull her into a light sleep. Nora’s humming had comforted her all those years she’d been sick at Ravensmoore. While everyone else lived their busy lives out around her, she’d done little but survive, taking comfort in the small things that brought her joy. A sudden crash caused the coach door to vibrate. Victoria screamed and bolted upright as Lazarus pressed his nose and giant paws against the carriage window. A low growl rumbled in his throat. “Highwaymen!” Nora’s hand crept to her neck, and fear filled her eyes. “We must find out at once. Someone may be hurt.” Victoria threw open the door, and Lazarus bounded into the mist. “Lazarus! Find!” She called after him, but he was already well on his way. She stepped from the coach, nearly tripping in her haste. But the warning wasn’t necessary. Victoria could hear Lazarus snuffling the ground someplace nearby. She bit her lip and told herself to be brave, even as her heart slammed against her chest. At the same time Lazarus let out a warning bark, the mist shifted. Victoria’s hand clamped over her mouth. A man lay on his side only a few feet in front of her. She shouted back to the coach. “I’ve found him! I need help.” She dropped to her knees and touched his shoulder. He didn’t move. She touched his arm and gently shook it. “Sir, are you conscious? Are you injured?” But before she could investigate further, strong arms lifted her and turned her away from the sight. She assumed it was Mr. Smythe, the carriage driver. “This is not something a lady should see,” the man said. But as he turned her from the body, she caught a glimpse of the man’s head. She gasped. There was just enough light to see streaks of blood upon one deathly pale cheek. “We hit him,” she cried. “The coach—” She lifted her head expecting to see the kind eyes of Mr. Smythe and met the warm, brilliant, gray eyes of a stranger. “Who . . . who are you? Who is he? Did we kill him?” She buried her face in her rescuer’s shoulder to rid her mind of the sight. “It does not appear so, my lady,” he said, his voice low and comforting. He deposited her inside the coach. Before she could speak, Lazarus bounded in next to her, rocking the vehicle precariously. She patted his head to calm him, and when she looked up at the man again, she saw only icy gray eyes and a rigid jaw line. She wondered if it had been her imagination or if his eyes fre- quently switched from an icy gray coolness to a warm molten gray in only moments.. She wondered what this meeting might have been like under different circumstances. She heard the stranger and Mr. Smythe lifting the injured man to the driver’s seat. “God have mercy,” the driver said. They approached Carlton House a few minutes later. Victoria clutched the edge of the seat, attempting to recover from what had happened and what she’d witnessed. As if he understood, Lazarus licked her hand. The coach came to a halt. The fog still lay heavy on the ground. Victoria could barely make out the two figures moving toward the door and into the palace. But even as their images faded, her thoughts returned to the stranger who’d lifted her away from the bleeding man and carried her back to the coach. The stranger with strong arms and fascinating gray eyes. Victoria found her strength as the fog lifted and patches of sun- light appeared through the trees, dappling the ground with their shadows. London came alive. Though her curiosity remained keen, she turned her thoughts to her brother and kept her mind on the joy it would be to see him again. He’d only been absent from their home at Ravensmoore for two months, but it seemed far longer. Thank you to Jillian and Realms through CFBA for sending me a copy to read and review!